“God has given me little that I might learn to trust Him more.” Those are the words of Marta Torres. Marta is not a pious, Latina saint from yesteryear. 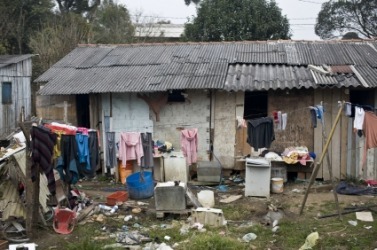 She is an impoverished, middle-aged mother of two from El Salvador. Yet, if holiness is measured by maintaining faith within great difficulty, Marta is indeed a saint. I first met Marta while standing on a street in the city of San Salvador next to her house. To be fair, the street was more of a sidewalk and her home more like the corrugated tin clubhouse I built with my friends when we were children. I learned that she had built her house when she was a child as well – almost 40 years earlier – and she still lived in it. It was the late 1970s. Marta was a child living on the streets, having been abandoned by her parents in the midst of El Salvador’s brutal civil war. She found an empty corner in a poor neighborhood and began collecting cast off pieces of lumber and tin to build herself a hovel. Rusted metal, termite-infested timbers, cockroaches as big as your hand, no appliances, no sanitation, no floor, and in the Central American rainy season the dirt floor of her home would flow with knee-deep water, sewage, and mud. But given her desperate station in life, it was a roof over her head, and eventually a roof over her two daughters’ heads as well. Marta was discovered by an American missionary who felt that something had to be done to help. Marta reluctantly agreed. The portrayal of the poor as parasitic opportunists looking for an easy handout is patently false. Marta didn’t have much, but she had survived all these years by standing on her own two feet. It was the prospect of her daughters living in an improvised shack for decades, as she had, that opened her heart to receive help. Thus, I found myself plunged into Marta’s story with a dozen other USAmericans. We tore down her old shack, placed a foundation and floor, raised walls, and put on a roof. We insulated and painted, installed a toilet, constructed a fence around the home for her safety, and poured a little concrete porch. The Torres ladies sank their hands into the fresh cement, marking the occasion with the date. Finally, we gathered in a circle as all the neighbors looked on (including the local gang leaders), dedicated the home to God, thanked him for bringing us all together in a glorious orchestra of grace, and handed Marta the keys. When it rained like a monsoon later in the week, Marta and her daughters slept warm and dry in new beds (the first they ever owned), without a drop of rain on their heads or a speck of mud on their feet. In the end, what Marta gained was miniscule compared to what my friends and I received. As we worked, the joy dripped off our cheeks tasting of the words of Jesus: “It is more blessed to give than to receive.” I also learned that faith like Marta’s, nearly impossible to understand, is even more impossible to emulate. As a middle-class American, I have infinitely more material means than Marta; I have more than most of the world. Faith, to someone like me, is more often a spiritual concept rather than a living reality. It is something invoked when life is simply not going my way, rather than a sustaining power within desperation. Simply put, I don’t have faith like Marta because I’ve never had to employ such faith. My life, though not without its challenges, by comparison has been quite comfortable, and comfort does not grow faith. Faith, like any muscle, grows by means of use, application, and exercise. “God has given me little that I might learn to trust Him more.” We who have been given much might learn a great deal from those with such faith. Certainly, we can alleviate their sufferings. And to be sure, they just might save our souls.